We have decided to encrypt our harddrives on our upcoming Windows 8.1 environment using BitLocker. I had no previous experience with BitLocker, so I started out reading and learning and eventually got it to work. All the necessary information was spread across several TechNet articles, so I decided to put together a post explaining how I did it. 4) Configuring the task sequence in ConfigMgr was pretty straightforward. 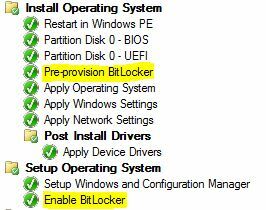 2012 SP1 has added support for pre-provisioning of BitLocker, which means SCCM will start encrypting the disk right after partitioning of the disks, and will be done with the image. Make sure the steps are exactly as on the picture. 5) Finally I installed the BitLocker Drive Encryption Administration tools on my DC’s, which enables me to view the BitLocker recoverykeys on the computer objects in AD.